100% Air Root Pruned Grow Bag. Our patented mono-filament technology stops circling roots and produces healthier branching root systems. Prevents Overheating of Root System. Air pruned roots are removed from the outer walls, protecting plants from extreme heat or cold. Fibrous Roots = Quicker Crop Rotation. Roots Enhancement translates into quicker crop rotations and faster establishment in the landscape. Improves Water & Nutrient Uptake. Fibrous roots penetrate the soil, providing for a continuous growing pattern, improving oxygen exchange, beneficial bacteria growth, and root systems less prone to disease / fungus. No More Soggy-Soil or Soluble Salts. If you have any questions about this product by SweetRoots, contact us by completing and submitting the form below. If you are looking for a specif part number, please include it with your message. Root Pouch Grow Bag Gardening System! 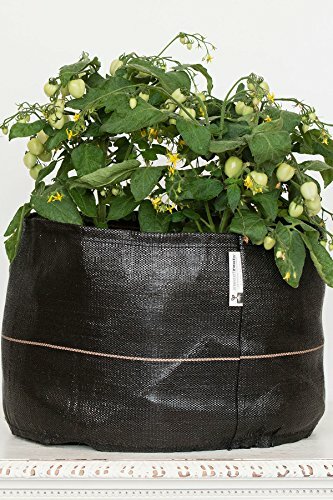 The World's Only Plant It And Forget It Grow Bag Gardening System!